Fire pits are excellent outdoor furniture pieces to own. They provide warmth on cool evenings, but can also act as centerpieces during social gatherings. If you're considering investing in a fire pit, you may be overwhelmed by all of the choices on the market today. To help you narrow down your choices, use this buying guide that details the size options, functions and brands so that you can pick the perfect fire pit for your home. First, you must decide what size your fire pit will be. Are you looking for a permanent feature or something more portable that you can take on trips? Fire pits can be large, permanent elements in your outdoor space or smaller, foldable accessories to bring along on a camping trip or anything in between. Larger fire pits can hold more wood, therefore creating a bigger fire, but do you have the means to accommodate this bigger size? If you intend on moving your fire pit often, it might not be the best option. Think carefully before purchasing a fire pit over 3 feet wide because when it comes down to it, fire pits are supposed to be enjoyable, not a hassle. Smaller fire pits are made with the intent to be moved around often. If you'd like to have a fire pit that you can bring camping or to a friend’s house; this is the size to choose. Some of these smaller fire pits even have foldable legs and carrying cases for more convenient transportation. You can also find portable fire pits with wheels for easy ash cleanup and transport. Steel fire pits consist of a wide variety of models that vary in price and quality. Steel is a great material because it can be easily molded into any shape imaginable. Just be careful, unprotected steel does rust over time, so be sure to purchase one that is powder coated and be aware of the physical changes that your fire pit may endure. High-end models are usually handmade by a steel artisan and are extremely unique, while the less expensive models are very common and come in many styles and sizes. Copper is the cream of the crop when it comes to fire pits. These will not rust - in fact, most fire pits made from copper develop a desirable patina over years of use. Copper can be molded into ultimately any shape and will last virtually forever. Copper products do tend to be on the expensive side, but the cost is worth it in the long run. Grilling is as American as apple pie and having a fire pit that can double as a grill is extremely efficient. Many people also think that food prepared over an open flame is more delicious as well! Many of Serenity Health's fire pits come with a cooking grate, but you can also buy a grate to fit fire pits that don't already come with one. Fire pit tables function in multiple ways. These multipurpose fixtures provide heat for chilly nights spent in your outdoor area and offer a great surface to place drinks when having an outdoor get together. Fire pit tables range in size from coffee table height to dining or bar table height. With beautiful designs like mosaic tile, decorative glass, wrought iron and more, you can easily incorporate this kind of table into your outdoor furniture set. Artistic fire pits are great for those who want a more unique look on their porch or pool area. These fire pits are designed to create an artistic look that's sure to make a statement in any outdoor area. A campfire ring is a great lightweight and safe option for backyard campfires. If you want to enjoy a simple campfire safely without breaking the bank or making more work for yourself, a fire ring may be the perfect option. Whether you're purchasing a toaster or a TV, brands are part of your decision process. Although brand name fire pits are often less known than Sony or Toshiba, there are some definite differences between manufacturers that consumers should know. Shop our exclusive line of Sunnydaze Decor fire pits and accessories at Serenity Health & Home Decor. You won’t find these premium-quality fire pits and fire pit accessories anywhere else online. Because Sunnydaze Decor is our in-house brand, we can offer same-day or next-business-day shipping on most fire pits, protective fire pit covers, spark screen covers, log racks and other accessories. Create a warm campfire or a welcoming place for conversation on your lawn. Take a portable fire pit to the beach or park. Made from 16 gauge cold rolled steel, these durable fire pits will show off your team allegiance. Each comes with a BBQ grill so that you can cook your pre-game food while enjoying an outdoor fire. 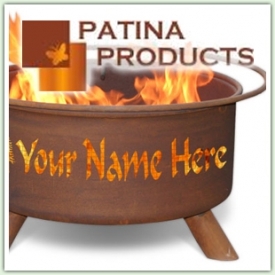 Patina Products also provides all the accessories you need with a fire pit: a fire pit poker, spark screen, and outdoor weather cover to keep your fire pit clean and dry for the next use. Enhance your game experience with these fire pits! 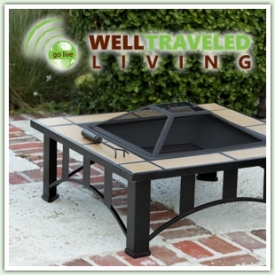 Aiming to satisfy your outdoor heating needs, Well Traveled has a selection of fire pits, patio heaters, and grills. Whether heating your patio with fire or electric heat, Well Traveled has options. The modern designed patio heaters keep your outdoor living space warm on chilly nights, and the grills enhance your dining experience. The classic fire pits add warm and ambiance to any event. Well Traveled works to provide you with efficient and elegant heating options.